Cosmossports is not the ordinary sporting goods company; on the contrary, it takes the lead by featuring a different view to all sports enthusiasts to find new trends and a great quality and consistency for fashionable sporting goods and casual wear. We are currently able to serve even up to 60,000 unique visitors to our online stores with everything running perfectly. Cosmos Sport SA was established in September 1991 with the creation of the first - Cosmos Sport - store, selling sportswear in Heraklion, Crete, while today numbers 18 stores. It is the first sportswear retailer in Crete and one of the three biggest in the country. 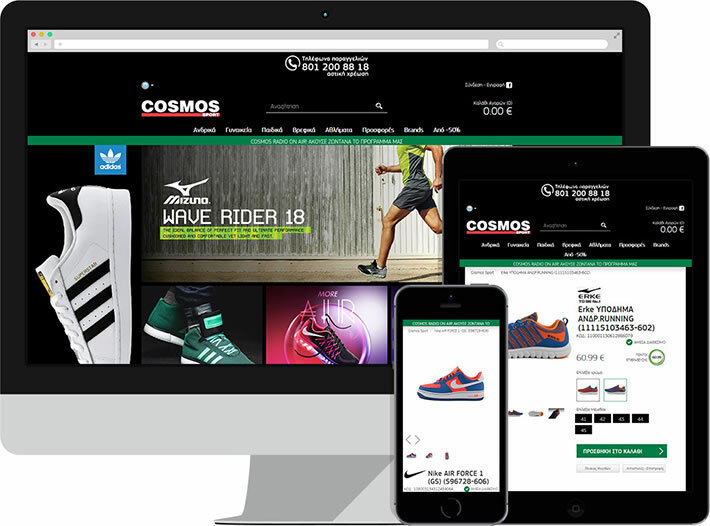 As part of the company development, an e-shop was designed and developed (www.cosmossport.gr) in order to expand the customer base throughout the country. All the above constituted a negative factor for the performance of the e-shop. In addition the resources were specific and an upgrade would translate into additional costs for the company. The solution to the problem was given by Microsoft with the whole set of their products and services as they are described below. • Windows Azure Content Delivery Network (CDN). We released the photographic content of the products from being given through the website. High availability and high-speed data transmission lines are translated into an advantage for the online store. • Windows Azure SQL Database + DataSync Service (PaaS). We achieved complete update of the website from the Cloud with information about the pricelist - availability of products and by taking orders and synchronizing this information with the ERP of the company. • Windows Azure Virtual Machines. The e-store was designed and implemented using Java Servlet technology with Tomcat container on Linux OS. This was not an obstacle because with Windows Azure Virtual Machines (IaaS) technology we managed to set up a Linux Virtual Machine. Now we can configure in real-time the availability of the computing power or the memory of the Virtual Machine. • Windows Azure. The most important is that with Microsoft's Cloud technology we elliminate the costs mentioned above in an On Premise installation. > focus on sales and the quality of their products and services being sure that the information system will seamlessly operate 24/7 365 days per year. > use the saved, from the transfer to the Cloud, costs for the company's development.